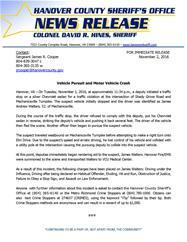 Hanover, VA – On Tuesday, November 1, 2016, at approximately 11:34 p.m., a deputy initiated a traffic stop on a silver Chevrolet sedan for a traffic violation at the intersection of Shady Grove Road and Mechanicsville Turnpike. The suspect vehicle initially stopped and the driver was identified as James Andrew Walters, 52, of Mechanicsville. During the course of the traffic stop, the driver refused to comply with the deputy, put his Chevrolet sedan in reverse, striking the deputy’s vehicle and pushing it back several feet. The driver of the vehicle then fled the scene. Another officer then began to pursue the suspect vehicle. The suspect traveled westbound on Mechanicsville Turnpike before attempting to make a right turn onto Elm Drive. Due to the suspect’s speed and erratic driving, he lost control of his vehicle and collided with a utility pole at the intersection causing the pursuing deputy to collide into the suspect vehicle. At this point, deputies immediately began rendering aid to the suspect, James Walters. Hanover Fire/EMS were summoned to the scene and transported Walters to VCU Medical Center. As a result of this incident, the following charges have been placed on James Walters: Driving under the Influence, Driving after being declared an Habitual Offender, Eluding, Hit and Run, Obstruction of Justice, Failure to Obey a Stop Sign, and Assault on Law Enforcement. Anyone with further information about this incident is asked to contact the Hanover County Sheriff’s Office at (804) 365-6140 or the Metro Richmond Crime Stoppers at (804) 780-1000. Citizens can also text Crime Stoppers at 274637 (CRIMES), using the keyword “iTip” followed by their tip. Both Crime Stoppers methods are anonymous and can result in a reward of up to $1,000.